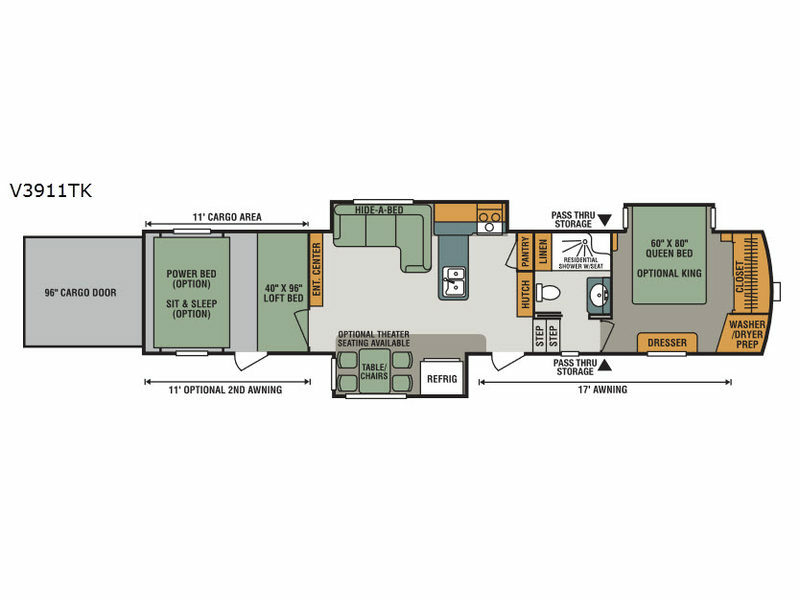 Triple slides, two entry doors, a loft, and plenty of room to spread out are just a few of the features that you will find inside this Venom V3911TK toy hauler fifth wheel by KZ! 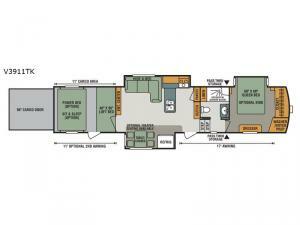 Step inside this fifth wheel and immediately notice how open and spacious the kitchen and living area are. With dual opposing slides you will have enough room to entertain a few guests. The curb side slide has a refrigerator and table/chairs or you can choose optional theater seating in place of the table/chairs. On the opposite side there is a slide with a l-shaped hide-a-bed, l-shaped counter with a double kitchen sink, three burner range, and overhead cabinets. The pantry is quite large, and next to the pantry there is a hutch. Along the rear wall you will find an entertainment center which is sure to bring enjoyment. Also along the rear wall there is access to the loft bed. In the cargo area you will find a 96" cargo door which allows for easy loading and unloading of your off-road toys. You can even choose a ramp door patio option with entry steps and an electric awning if you like. For additional sleeping space you can choose to have an optional power bed and an optional Sit and Sleep. You will also find a side door in the cargo area which is handy once your toys are off-loaded, then you can use the side door instead of the cargo door. Proceeding towards the front of the fifth wheel, step up two stairs and find the bathroom on your left. Inside the bathroom there is a toilet, residential shower with seat, sink, medicine cabinet, and linen storage. Retreat to the front bedroom after a fun filled day and find a slide with a queen bed, or you can choose an optional king bed if you prefer a bit more sleeping space. Across from the bed there is a dresser, and along the front of the room you will find a closet, plus in the corner there is a washer/dryer prep space for your convenience. Outside you can store your exterior camping gear in the pass through storage area. 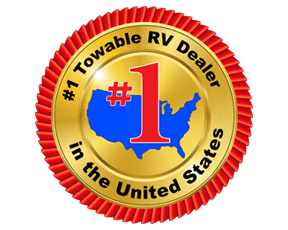 You will find a 17' awning which provides some nice shade during the day, and there is an optional 11' second awning over the cargo area, and more!